the yarn is beautiful! i have some of the aran weight in my stash. i admire you for being able to knit so much stockinette. i wish i had the patience for it! 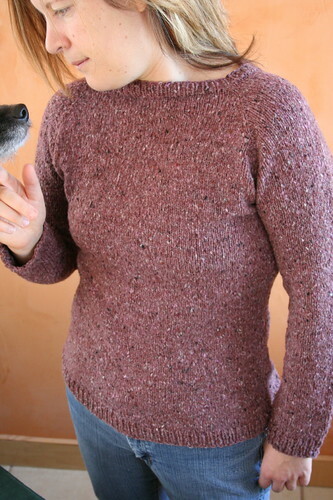 i’d love to have a simple sweater like this. great job! That looks great! The simple styling really lets the yarn sing. Your sweater is beautiful. And I love the colour. Congratulations! A wonderful sweater. I like the simple style combined with the tweedy yarn. 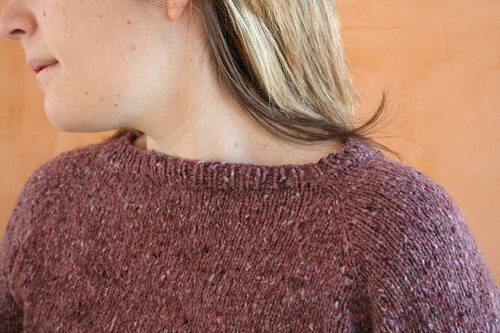 There is something so satisfying about a very basic, yet perfectly fitted, pullover. And the yarn you chose is so beautiful. Did you know I’m a huge sucker for purple? Win! Love it! 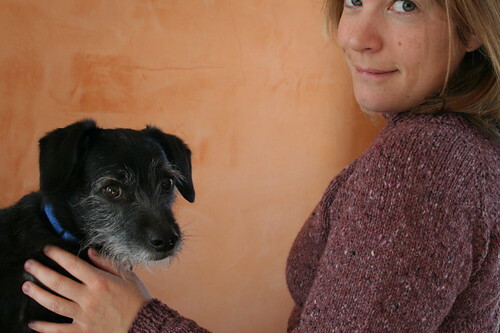 A simple tweed sweater – perfect! My ribbing is the same way. It always looks loose for some reason. If anyone gives you any tips or tricks, let me know! I have a bag of that same yarn, good to know about the way it grows! the sweater is lovely! and jacques is a total schmoo. It looks gorgeous! I love the color and the yarn works perfectly for it! It’s interesting what you said about the yarn stretching though. I used it for a sweater as well, and it has also stretched a bit. I thought it was my sweater though, or how I was wearing it. Beautiful sweater! The fit looks perfect on you! I think the ribbing looks good, but if you knit continental, try knitting the ribbing english; that’s tightened up my ribbing in the past. I love it! The tweediness is just perfect. Love the sweater on you. Your dog is adorable! 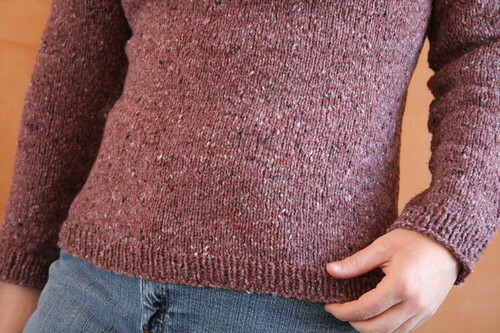 i’m thinking that the ribbing looks this way because of an optical illusion. 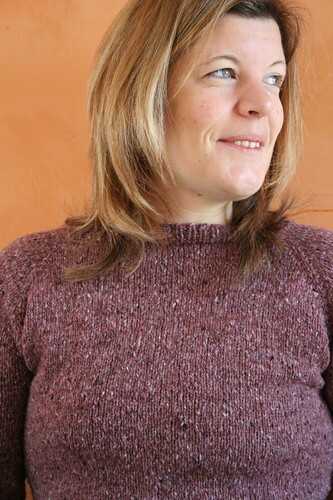 the Vs of the knits are pointing in the opposite direction of a bottom-up knit. i’m not sure if there’s a thing that can be done about it! Really like to tweedy look of your sweater. And you are right about the hems and cuffs. I love top down sweaters (! ), and I have the same trouble. What I do is, I do not bind off loosely (as in, dont go up a needle size for the bind off) and do not bind off in ribbing. If you bind off knit wise, the chances of the hem flaring up is minimal. I came up with this after a lot of trial and error…but I am sure there are other suggestions out there. It’s so great you had the first sweater to guide you! There’s no way this will turn out bad, it just can’t happen :). Another beautiful sweater! I love the color on you. Happy 2009! You might get a slightly better result if you go down a needlesize while knitting the few last rows of stockinette. The same goes for the bind-off. Go down another needlesize in the last one or two rows of k1 p1. This makes the bind-off look neater.